The availability of trading via the cash-substitutes makes the payment and settlement system as the inseparable part of economic and financial market. The National Payment and Settlement System /NPSS/ includes the payment instruments, the banking operations of money circulation coordination and the interbank payment system as the Committee on Payment and Settlement System of the Bank for International Settlements defined. The relevant legislations, agreements and cooperation and technologic solutions are also involved in it. According to the Article 4.2 of the Law on Central bank ‘Within its main objective the Bank of Mongolia shall also promote balanced and sustained development of the national economy, through maintaining the stability of money, financial markets and the banking system.’ BoM promotes to ensure the efficient, fast, incessant and assured payment system functioning. The introduction of the new program which allows promoting interbank non-cash payment system in 1997 was truly a big step in an accounting system of the Bank of Mongolia. Within the scope of World Bank project - 2006 ‘Extending the Financial Capacity’, the BoM Clearing House was founded and the gate to execute the interbank transactions in separation of large and small amount was opened. 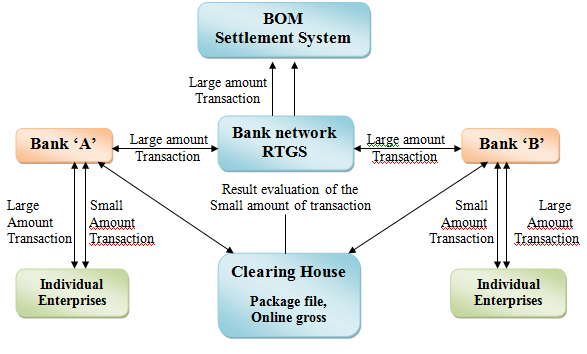 Furthermore, the 2009 conveyance of ‘Bank network’ RTGS was significant advance to maintain the secure, fast and effective payment system of the interbank large amount transactions. 2010 transmission to the card switch system turned on the opportunity to deliver the ‘One card - integrated service’ to every Mongolian. The new financial products, services, and IT advancements has become a push to found the new payment instruments. Like the online and mobile banking service, new payment and settlement means are spreading out in Mongolian financial market. Below is the chart of the interbank large and small amount transactions.